Fretless chose its name to represent the freedom, and challenge, of making music with a fretless instrument, the human voice. These five (3 men, 2 women) multitalented singers sharpened their chops performing with many other jazz and classical groups, particularly those performing in the Boston area; they began singing together in 1999. "All the Things" is a finely-crafted, varied collection of 18 covers ranging from the classical and sacred (Palestrina's "Exultate Deo," Debussy's "Dieu! Ou'il La Fait Bon Regarder!," Durufle's "Ubi Caritas" and "Brahms' Lullaby") and rock (Loggins & Messina's "Your Mama Don't Dance" and the LaBelle hit "Lady Marmalade," to pop and R&B ("James Taylor's "Lonesome Road," Randy Newman's "Short People" and Smokey Robinson's "Tracks of My Tears") reggae (Jimmy Cliff's "Many Rivers to Cross") show tunes (Hammerstein's "All the Things You Are" and Gene Krupa's "Some Like It Hot", arranged by Mel Torme) and jazzy blues (the Lambert/Hendricks/Ross arranged "Moanin'"). We particularly enjoyed soprano Anna Choi's solos on "I Can't Make You Love Me," "Tracks of My Tears," "Many Rivers to Cross" and "Lady Marmalade." 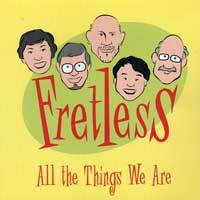 An impressive, very entertaining debut CD from talented Fretless!